During the long break from blogging, I discovered how soothing it is to sit under a weeping willow. In fully grown willows, the thin branches droop nearly all the way to the ground, forming a delicate curtain around the fortunate soul that happens to sit underneath it. Their peculiar geometry makes them a delight to watch when they sway in the wind. No matter how fast the breeze, a willow’s branches seem to lilt along peacefully from side to side in a rhythm all their own. In summer, you are sheltered behind a lush emerald curtain with sparks of sunlight, playing temporary home to oriole chicks. In winter, the curtain will become a wisp of cream-colored cellulose; the orioles will be long gone, having left behind exquisite nests that you can only see when all the leaves have fallen. Whoever landscaped Willow Pond in Mount Auburn Cemetery must have known about the calming influence of the willow tree. Some dozens of years ago, the architects had the foresight to plant some of these lovely trees – a Wisconsin weeping willow, a golden weeping willow, a weeping beech, and a weeping katsura tree near a depression in the ground that became a pond. I have, over the past few weeks, come to discover this marvelous refuge in the great cemetery, graced not only by the willows, but by some dawn redwoods, marsh plants, azaleas, kousa dogwoods and a lovely sweet bay tree whose blossoms look like spherical white magnolias sheltered inside a cone of leaves. Here, if you sit for long enough under a willow in the summer, you will see Baltimore orioles in their splendid orange summer finery flying busily from tree to tree, whistling sweetly as they go. And you might just spot a female oriole discreetly landing on a thin branch of your own special willow and entering its little nest, being welcomed by the feeble “cheep cheep cheeep” of invisible newly hatched oriolets. Blackbirds and grackles punctuate the oriole whistles with their workmanlike voices, and robins – always dozens of robins – go about their constant chirping. I consider the robins as guardians of the cemetery, because of the way they hop from tombstone to tombstone. Who would mind having a bird alight on their resting place? But that is not all, for the pond adds a new dimension to the ecosystem of birds, trees, soil and squirrels, and offers rare enjoyment to the beleaguered city-dweller who happens to visit. The trees are planted in such a way that, just beyond the willow curtain is the water’s edge. 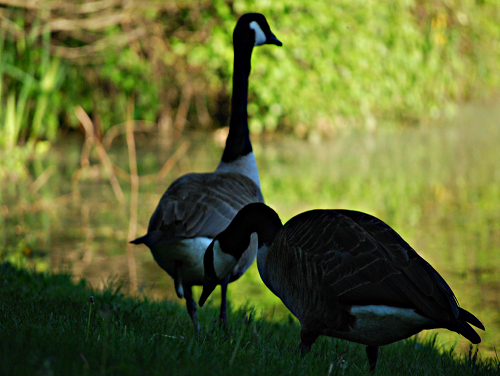 At different times of the day, the pond is visited by herons, ducks, cormorants and geese. There is also a comical bass drone of what could only be a huge bullfrog. The bounty is not without its dangers for the smaller birdfolk; hawks come regularly and perch near the tops of the redwoods. 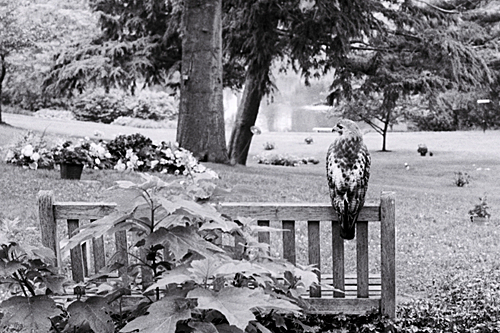 Today, I saw a young red-tailed hawk surveying the goings-on, perched on the backrest of a wooden bench. I had to do a double take to make sure that it was a real bird and not a hawk sculpture, of which there are a few in this cemetery. The bird eventually flew into the trees whereupon a strange episode ensued. Many little birds – among them orioles, robins and blackbirds – suddenly kicked up a warning ruckus and began harassing the hawk. After last year’s incident with the mockingbird, I wasn’t surprised about the robins – they are hardy territorial combatants and you don’t mess with them and expect to get away with it – but I could never have imagined that a little orange-yellow oriole would have the audacity to mockbomb a red-tailed hawk many times its own size. The hawk looked flustered, and it began to flee from tree to tree followed by this dedicated platoon of tiny birds intent to banish it from the pond. It was a young bird, and as such, a new flyer and an inexperienced predator. I began to feel sorry for the awkward Goliath, having recently witnessed the travails of Larry, Lucy and Lucky – three gorgeous redtail chicks who have fledged recently, leaving the nest that their parents had built in a difficult nook of a Cambridge shopping mall. I hope this young fellow will find his wings. I am frequently surprised when people who live in and around Cambridge tell me that they have never been inside Mount Auburn, prompting from me a heartfelt hosannah about the cemetery’s botanical marvels. Less frequently, someone will come and tell me that they took up my recommendation, and went inside and thought it was beautiful. If you are one of those rare folk who take a hint from an unhinged blogger, then please go in and spend a few minutes beside Willow Pond. Perhaps, you will forget your cares for a while. 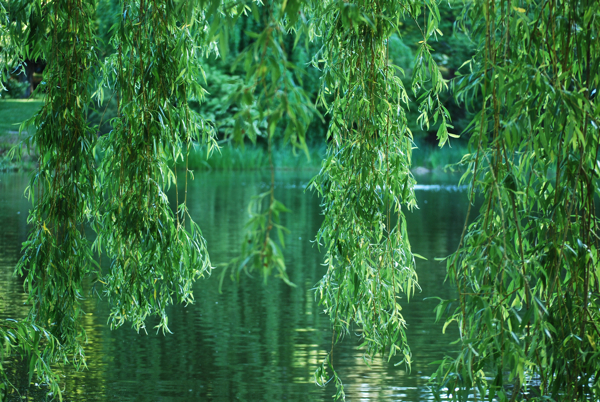 Perhaps, you will become quietly joyful for no good reason, just because you happen to be sitting under a willow tree. That is a remarkably beautiful invitation, Polaris. Thank you for this description; it alone was an oasis in a busy day. And I’m not even sitting under a willow tree. Beautiful –the willows and the pond. I do adore a pond. Polaris, I recently saw two hummingbirds chasing a Cooper’s hawk! It might have been a young hawk, like the one you describe, for she seemed confused by the two little helicopters whirring over her head and she kept circling back, even as they dive-bombed her again and again. Tai! Nice to hear from you again! It blows my mind to read that zippy little hummingbirds can bully a hawk. It must have been quite a sight. (It also blows my mind that you can tell it was a _female_ Cooper’s hawk). Being from Newton, the next town over from Watertown, I actually have family in Mount Auburn Cemetary. You’re right. It is a wonderful place to visit and take a long walk, especially if you want to relax and think.